Yesterday's ink was one that I didn't care for. Today I'll be showing the red that I did like quite a lot. Widowmaker is a deep red that has about the same color as a red wine or maybe fresh blood. The shots that I took in full sun show it as a bright red, but that isn't what this ink usually looks like so I took another set of pictures in indirect sunlight today, and I think they are far more representative. I didn't see very much in the way of shading with this ink, but that doesn't make me like it any less. In my home office near the window. This ink has a great flow to it and it doesn't bleed through even cheap copy paper (at least not from the pretty fine nib on my Wing Sung 101) though you will be able to see it a bit on the other side of the page. Sometimes with an ink that flows as well as this one (Tsuyu-kusa, I'm lookin' at you) you end up with an ink that feathers or spreads out like mad. That's not the case here. Widowmaker is keepin' it tight. It looks like it will stand up a little to some water, but it's not water proof. So far, this is my favorite red. I have a few more reds to try before I can really give out a "favorite" tag, but this one will be hard to beat. In the future, look for me to be talking about Noodler's Red-Black , English Roses (both of which look more red in the vial than in those links), and Cayenne as well as Diamine's Vermillion. 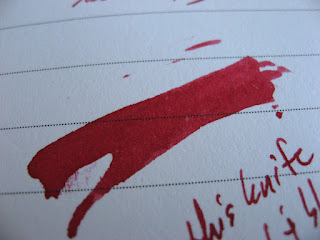 I also want to get my hands on some Ox Blood and a sample of J. Herbin's Rouge Hematite (it looks excellent).